According to the OAuth2 specification, a resource server is a server hosting the protected resources and capable of accepting and responding to protected resource requests. In Red Hat Single Sign-On, resource servers are provided with a rich platform for enabling fine-grained authorization for their protected resources, where authorization decisions can be made based on different access control mechanisms. Any client application can be configured to support fine-grained permissions. In doing so, you are conceptually turning the client application into a resource server. The first step to enable Red Hat Single Sign-On Authorization Services is to create the client application that you want to turn into a resource server. On this page, click Create. Type the Client ID of the client. For example, my-resource-server. To turn your OIDC Client Application into a resource server and enable fine-grained authorization, click the Authorization Enabled switch to ON and click Save. General settings for your resource server. For more details about this page see the Resource Server Settings section. From this page, you can manage your application’s resources. 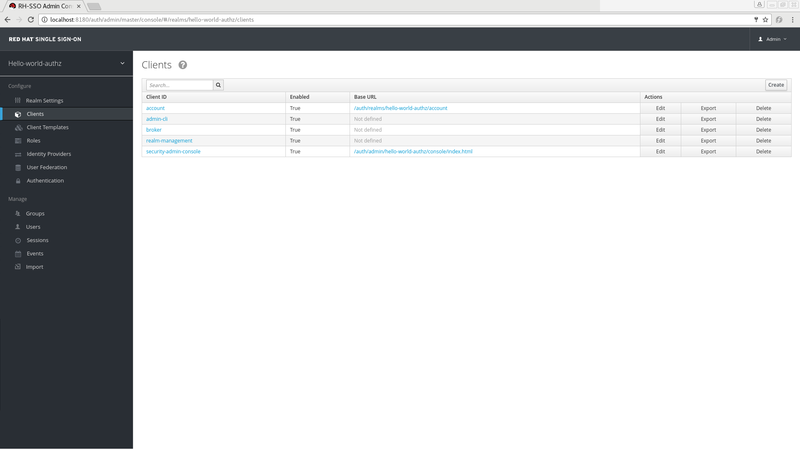 From this page, you can manage scopes. From this page, you can manage authorization policies and define the conditions that must be met to grant a permission. From this page, you can manage the permissions for your protected resources and scopes by linking them with the policies you created. From this page, you can simulate authorization requests and view the result of the evaluation of the permissions and authorization policies you have defined. From this page, you can export the authorization settings to a JSON file. On the Resource Server Settings page, you can configure the policy enforcement mode, allow remote resource management, and export the authorization configuration settings. Specifies how policies are enforced when processing authorization requests sent to the server. (default mode) Requests are denied by default even when there is no policy associated with a given resource. Requests are allowed even when there is no policy associated with a given resource. Disables the evaluation of all policies and allows access to all resources. Specifies whether resources can be managed remotely by the resource server. If false, resources can be managed only from the administration console. 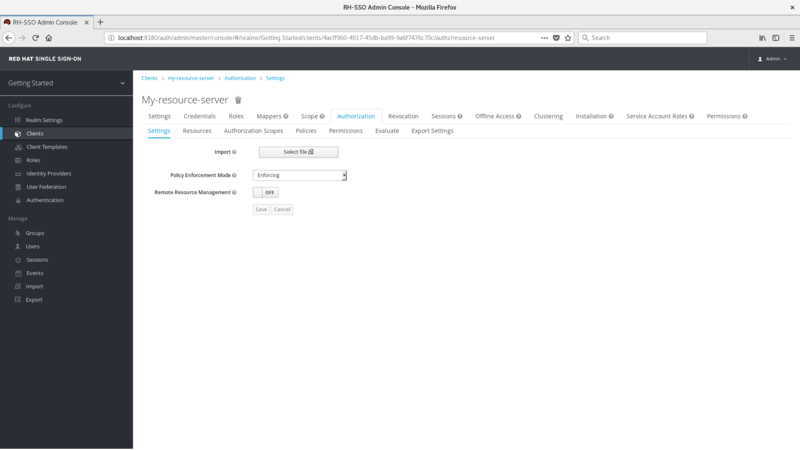 When you create a resource server, Red Hat Single Sign-On creates a default configuration for your newly created resource server. A default protected resource representing all resources in your application. A policy that always grants access to the resources protected by this policy. A permission that governs access to all resources based on the default policy. The default protected resource is referred to as the default resource and you can view it if you navigate to the Resources tab. This resource defines a Type, namely urn:my-resource-server:resources:default and a URI /*. Here, the URI field defines a wildcard pattern that indicates to Red Hat Single Sign-On that this resource represents all the paths in your application. In other words, when enabling policy enforcement for your application, all the permissions associated with the resource will be examined before granting access. The Type mentioned previously defines a value that can be used to create typed resource permissions that must be applied to the default resource or any other resource you create using the same type. The default policy is referred to as the only from realm policy and you can view it if you navigate to the Policies tab. Lastly, the default permission is referred to as the default permission and you can view it if you navigate to the Permissions tab. This permission is a resource-based permission, defining a set of one or more policies that are applied to all resources with a given type. You can change the default configuration by removing the default resource, policy, or permission definitions and creating your own. The default resource is created with an URI that maps to any resource or path in your application using a /* pattern. Before creating your own resources, permissions and policies, make sure the default configuration doesn’t conflict with your own settings. The default configuration defines a resource that maps to all paths in your application. If you are about to write permissions to your own resources, be sure to remove the Default Resource or change its URIS fields to a more specific paths in your application. Otherwise, the policy associated with the default resource (which by default always grants access) will allow Red Hat Single Sign-On to grant access to any protected resource. Navigate to the Resource Server Settings page. Click the Export Settings tab. On this page, click Export. The configuration file is exported in JSON format and displayed in a text area, from which you can copy and paste. You can also click Download to download the configuration file and save it. To import a configuration file for a resource server, click Select file to select a file containing the configuration you want to import.